I may have said this once before, but it requires a bit of reiteration: I enjoy getting older. Having hit the young age of 43 recently, the month of April has been non-stop in celebration. Food, cakes, pies, food, cookies, food, food, and more food. Somewhere in between there is sleep, brushing and flossing, work — I have a mortgage and a graduate school loan to pay off — and getting ready for more celebration. Bah to those who weep and moan when they approach their birthdays. I may not be a Rockefeller, but I certainly am not lacking enough money in the bank to fund my wanton appetite. This year my friends took me to one of my favourite Indian restaurants: Udupi Palace. It was back to the Northside for some authentic dishes laden with curries, cumin, and other spices that make your eyes cross with delight. Found on the main strip of Devon Avenue at 2543 W. Devon Avenue is the best vegetarian Indian restaurant in the city. Very much representative of South Indian cuisine, the food is spiced just right yet not to the point of having you feel like you have induced an ulcer. Spacious and still filled with friends and families getting their fill, Udupi Palace was the perfect spot for yet another evening of celebration for me. And after a moment of catching up with each other, since several of us have not been in physical contact for several months, it was time to get down to business. 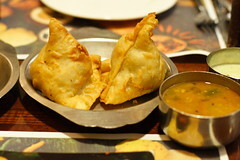 We started with vegetarian samosas. Hello, baby darling! These flaky pastries filled with potatoes, spices, and peas reminded me of why I usually go to Udupi Palace and order a good dozen or so of them for snacks at home and on the go. Eaten with tamarind or green chutney, they are easily one — or more — of my favourite lovers. 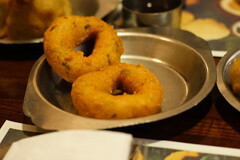 Then we had medhu vada. What’s up, delicious? I have been a stickler for having no fried foods in my diet. Then I agree to an order of these fried donuts. The marriage of the medhu vada and sambar soup was a marriage made in heaven, and even my growling belly agreed. And because we knew that we were going to be ridiculous with the number of entrées that we were going to order, the samosas and the medhu vada were the only two appetizers that we had. When the appetizers did come, it was time for action. My all time favourite hit the table and we should have stopped at that. 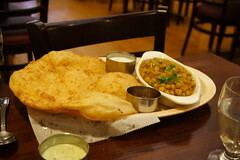 Those chickpeas in that rich gravy with a huge fried poori were ridiculously delicious, addictive, and wrong. 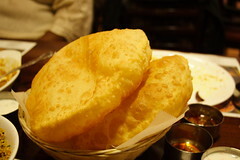 In the traditional way of eating Indian food, we used the poori, or rather batura, and scooped the peas with our hands. We even used leftover poori to sop the gravy, this time sopping being appropriate and not embarrassing. 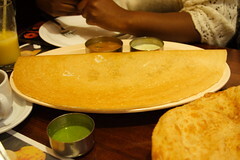 Then we had masala dosa. Lover, where have you been? This thing was colossal and to the point of stretching the full length of the large plate on which it was served. A tasty crepe stuffed with potatoes and spices and something else that apparently tricked our bellies into believing that we were not already slightly stuffed and should have stopped. I still have no idea how we managed to gobble that entire masala dosa and I do not care that there were four of us at the table taking care of business. By the time we had finished licking our fingers after the masala dosa, we had to sit still for a while and let the food go down. I know that I was getting the usual feeling of sleepiness and the occasional slurring of words — like a man filled with too much drink. We all knew that there was more to be had, so gluttonous, so unnecessary, so satisfying. So, we continued to sit and have conversation to catch up on what all had been happening since we all had gotten together last. The feeling of being induced into a food comatose lifted. Words had started being crisper. And the menu came out — again. Taking a light approach, we began with tamarind rice. 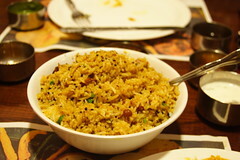 Yet another lover, this rice was spiced with tamarind, dates, and some exotic nuts that went down nicely. And as if the tamarind rice was not enough, we had bisi bele bath, another rice dish but complemented with lentils and seasoned with nutmeg, asafoetida, curry leaves, and tamarind pulp. Such sweet torture. Why do I treat myself to such pain? No, this would be pleasure and the kind that demands a cigarette afterwards. Add a basket of poori to the mix and we were wiping the side of the bisi bele bath dish after we had scooped out all that we could. The waiter had this look on his face like he could not believe people could partake of food in such a way. He did not know us very well at all. You all should have stopped at that point, you are saying. We are so non-compliant in that way and figured that we would try one more dish — this decision made after we sat for half an hour letting all of the other food settle. For the finale, it was bhaigan bharta. I have not had any bhaigan bharta that I have not loved and Udupi Palace has created the Utopian version that would make me leave my wife. Oh, wait, I am not married. But nevertheless, the creamed eggplant with peas were too much, too tasty, too delicious, and perfect for use to cheat on the wife that I do not have. 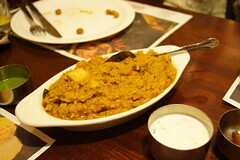 Honestly, we had been so stuffed with goodness that we were not able to finish the whole dish. 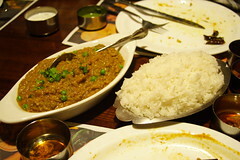 There comes a moment that you have to be honest with yourself and by the fifth scoop of bhaigan bharta my eyes were crossing, my speech was indecipherable, I was rather bold with butchering the Hindi language with the server, and the zipper on my trousers was undoing itself. That was definitely and indication of enough. Would I recommend Udupi Palace? If you read any of the above text, then you know the question is rhetorical. 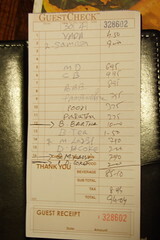 Would I recommend that you eat as much as we did? No! I will not overindulge myself in that fashion again like that. Then again, I think I may have made that promise to myself several times only to break it and find myself walking out of an establishment with very small steps and bent over from being too full. 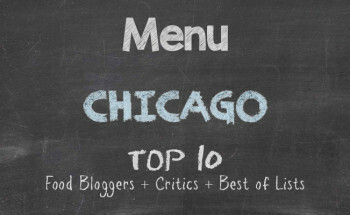 Will you pay a pretty penny for your good eats? If you do not go overboard the way that we did, and we still paid lower than I thought we would have had to pay, then you will also find the price very much appealing. For the vegetarian in you that loves some exotic spices in your food, make Udupi Palace a stopping ground for one of your meals. Celebrate. By the way, we did have some chai for after dinner tea. The masala calmed the bellies and helped me stay awake on the bus ride home.